2017 will go down as one of the more memorable construction years on record. Never has such positive vibes for the building community led to the heartburn that has transpired trying to operate their businesses – be they large or small, single or multi-family. It has been a wild ride, to say the least, and only time will tell if improvement is on the horizon. To offer some perspective, no builder would trade this year for 2008 – let’s be clear. Challenges in a lukewarm market are still better than sitting around talking about who gets stung in your next round of layoffs. However, challenging it has been, on many fronts, as core staples of the construction process - mainly lumber, labor, and lots, - stall progress and steal profits from all those “good vibrations” a housing recovery is supposed to feel like. In this installment of our market report we will take a look in the rearview mirror to see just what hit us. In part 2, we will attempt to peer into our crystal ball to see what may be lurking in the first half of 2018. To say that this year has been a whirlwind would probably seem an understatement to many of you. All the moving parts of the building process seemed to be in a constant state of disorder. Control seemed fleeting, even for an industry where a firm grip often means just one hand on the wheel. I will start with the lumber market because – number one, it has possibly been the area that has caused the most builder indigestion, and secondly, it is the easiest to document because numbers don’t lie. Surging lumber prices have been the norm rather than the exception throughout most of this year. These increases have come mostly in the form of aggressive, multi-week bursts that have left buyers stunned, with little time to react. So far this year, Contract Lumber’s Framing Composite Index* reflects five major runs – four upward spikes, and one downward correction. I should add that we are currently in the midst of a second downward correction. A run is characterized as market movement in our index of twenty dollars or more, in either direction. What makes these “runs” unique over the recent past is that there have been very succinct cause and effect events that have triggered these market movement. The first, and most intense run, came on the heels of the announcement that the U.S. would be resurrecting the Canadian – USA Softwood Lumber trade dispute. In a sequence of events that put the lumber market on its ear, the U.S. Lumber Coalition for Fair Lumber Imports filed claims in November, 2016 to the Department of Commerce of unfair trade practices against Canadian lumber producers. On January seventeenth, the U.S. International Trade Commission (USITC) voted unanimously in a preliminary ruling that Canadian lumber imports had caused injury to the U.S. lumber industry, essentially paving the way for the Department Of Commerce to open an investigation, and for lumber to start a historic climb. Starting with the January 27th Random Lengths report, lumber spiked 20 percent over the next four weeks as Canadian lumber mills started to raise prices in preparation of getting hit with a double-digit duty in April. Contract Lumber’s Framing Composite jumped over $60 in those thirty days, to an index level of $382.65. After a brief respite, the market took off on another run from March 17th thru April 21st, the weeks leading up to the awaited preliminary Countervailing Duty (CVD) decision. This five-week stretch saw a $40.72 surge, again fueled mostly by increases from Canadian producers, and from activity with the onset of the building season. It sent the market index above the $400 threshold for the first time since May, 2013. Speculation was rampant about the amount of import tariff that would be levied, with percentages as high as 30% being bandied about. When the preliminary CVD decision was announced by the Commerce Department on April 24th at “only” 19.88% (the market had increased 23% to that point), the market seemed to relax a bit, leading to the first negative market run of the year. Starting on April 27th and running through June 9th, our index dropped $41.31, or 11% over seven weeks. It is not unusual to see a downward adjustment following preliminary CVD announcements. This is mostly due to speculative buying leading up to the decision, and inactivity afterwards, when buyers try to grasp the impact of the decision. The market found the bottom in early June and started its most sustained run of the year. Over a seven-week period from June 9 through the end of July, the market covered its earlier losses and then some, spiking $52.40 (14%) and breaching the $400 threshold for a second time – a level it has not receding from since. It was during this time that the second installment of the trade dispute was announced, the Anti-Dumping Duty (ADD), with an average preliminary tariff decision of 6.87% levied against Canadian lumber producers. It appears that the timing of that decision (issued on June 24th) took a market that was grinding up in early June, to a frenzied trading level of double-digit weekly increases over the next month. It would also be reasonable to assume that a flurry of buying was taking place to bolster inventories at the height of the building season, and also to position inventory levels so buyers could stay off the market in the time period leading up to, and just after, a suspension of the original CVD collection. Trade law only permitted the Department of Commerce (DOC) to collect a preliminary tariff until August 31st and buyers anticipated the market would pullback once the DOC was no longer collecting the 19.88% cash deposits. The market never saw the impact. Just as the tariff was set to be rescinded, natural calamities in the form of forest fires and hurricanes buoyed the market and sent lumber on its fifth run of the year. Beginning on September 1st, the market experienced steady upward pressure, gaining $37.14 (9%) in the 7 weeks after duty collection was suspended. Catastrophic forest fires that started in July, continued to curtail or shutdown lumber production throughout central British Columbia. More than 150 fires burnt over one million acres in this prolific western spruce-pine-fir producing region. The aftermath will surely to be felt for years as over 22.5 billion board feet of lumber was destroyed. Canadian lumber imports were down 8 percent in the third quarter, just when the market was expecting a surge of non-duty wood to come across the border and help lower prices. And while they were fighting historic blazes to our north, Mother Nature took aim on the south as Hurricane’s Harvey and Irma smashed into Texas and Florida inside of a two week period around Labor Day. The long-term impacts from Hurricane’s Harvey and Irma are still being digested, but in the short-term, panel products surged to highs not seen since early 2013. The rebuilding challenges of these two very destruction disasters has sent a shiver up the collective spine of the building industry, as they ponder the potential impact on the costs and availability of building materials and construction labor. We are currently in the midst of what will undoubtedly be the last market run of the year. Since mid-October, the lumber market has been receding, led primarily by an OSB correction. Over the last six-week period, our index has dropped nearly $25 (6%) and currently sits at $413.63 – 29 percent above the index’s low back in January. It is not unusual to see the market withdraw in late fall as the flurry of autumn building activity winds down. The question becomes, how much downward pressure can buyers put on this market, and for how long, with inventory levels low and robust construction activity still taking place in much of the country. The other missing piece of the puzzle as the year comes to a close is the decision on the final 20.83% combined countervailing and anti-dumping duty. I say final in jest, as the appeals process is sure to be in play after the USITC makes its ruling scheduled for December 7th. History is on Canada’s side as all past appeals have favored them when utilizing a third party binding dispute-settlement process like NAFTA or the World Trade Organization. Let’s hope that the two countries can hammer out an agreement rather than draw out the uncertainty as we move into next year so that the lumber market can return to more traditional supply-demand dynamics. As if the lumber market weren’t enough to keep our minds occupied in 2017, the labor market competed with the lumber market for the attention of building professionals around the country who were trying to deliver projects on time, and on budget. Subcontractors were stretched thin with more work than they could handle. Not wanting to turn down work or disappoint existing relationships, subs were saying yes to work but could not ramp up their workforce to cover it effectively. Many resorted to splitting crews so they could start multiple jobs simultaneously. But, as could be expected, the results extended the overall time of completion and, to some degree, degrading quality. No trade was exempt from this shortage of a skilled labor. During and after the housing crash, the number of U.S. residential construction jobs plunged by 1.5 million, and only about half of the jobs have come back during the recovery period. In many way, this is a greater challenge than any the construction industry faces. The price of lumber really doesn’t matter if you can take it vertical. It’s no revelation that a majority of major suburban areas are dominated by an immigrant labor force. The current immigration climate in our country is putting a real strain on our largely Hispanic construction workforce – a workforce that has basically been responsible for building most of America’s homes and apartments for decades. There is no more important challenge to the housing industry than the chasm in labor supply and demand. According to NAHB analysis of Census Bureau data, building lots in 2016 had record high prices and record low sizes. The median lot value in 2016 was $45,000, up two-thousand dollars from the previous high of $43,000 in 2006. The median lot size of a new single-family home sold last year dropped to an all-time low of 8,562 square feet – less than 1/5 of an acre. The real housing bubble may be in the land – not homes. But despite record prices for lots, the average portion of the final sales price of a new single-family home attributed to the cost of the lot, is actually decreasing. In the years leading up to the recession, average lot values accounted for around twenty-percent of the sale price of the home. Since 2009, that number has steadily declined, dropping to 17 percent in 2016. It’s largely due to the rising prices of labor and building materials, which are outpacing the increasing costs of lots. The challenge still remains for builders to manage development costs, including burdensome regulatory costs, while building an affordable product. Finding municipalities that will allow higher-density developments with fewer restrictions will be critical moving forward to make a development pro-forma profitably attractive. Demand for housing is increasing at a consistent pace, driven by job and economic growth, rising homeownership rates and limited housing inventory. Current builder confidence is reported at its second highest monthly level since July, 2005, amid optimism about current sales and buyer traffic. It bodes well for a healthy finish for the single-family housing market to close 2017, and to kick off 2018. Nationwide housing starts rose nearly 14% in October to a Seasonally Adjusted Annual Rate (SAAR) of 1.29 million units, the highest housing production reading since last October. Single-family production rose 5.3% to a SAAR of 877,000 units. Year to date, single-family starts are 8.4% above their level over the same period last year. Volatile multi-family starts jumped 36.8% to 413,000 units, their highest level all year. The broad recovery could ease concerns about the housing market, which has been a drag on economic growth since the second quarter. The housing report, added to labor market, manufacturing and retail sales data, point to strong economic momentum as 2017 closes out. Housing completions for October hit their highest level in nearly a decade, to a rate of 1.232 million units. The homeownership rate has reached its highest level since 2014, according to third-quarter data release by the U.S. Census Bureau. Ownership rates climbed to 63.9%, but still remain below the 69% registered at the peak of the housing bubble a decade ago. The trend is causing analyst and investors to wonder whether the rental market’s good times are coming to an end. Additional factors weakening the rental market include a surge in supply and slower than expected job and wage growth. There is still plenty of opportunity for growth in the single-family housing market. One very encouraging statistic for that sector was that 40% of all mortgages in the second-quarter this year were from Millennials. Attracting these first time home buyers will be critical if we expect to sustain long-term health of new home construction. The problem is that the nation’s housing supply is at a 30-year low. Supply is insufficient and home prices are closing in on new all-time highs. The average sales price of a new home in September was $385,200. Measures of affordability are beginning to slide, especially for that entry level buyer. Housing affordability barriers may stall the all-important economic growth engine – household formations. Interest rates have edged up the last month and currently the 30-year fixed mortgage sits at 3.94%. The increase is blamed on investors selling off bonds in anticipation of tax reform that would swell the budget deficit and force more government borrowing. But, that is still an extremely low rate historically and helps the affordability factor of purchasing a new home. Real GDP rose by 3% during the third-quarter and housing permits were also up 5.9% in October, both signs that we will finish the year strong. Yes, it has been a crazy year in the building industry and the lumber industry, to be sure. It’s never been more important to keep your head in the game and to build relationships with strong supply sources – partners. Few buyers of lumber at any level anticipated that framing lumber would go on a record run. 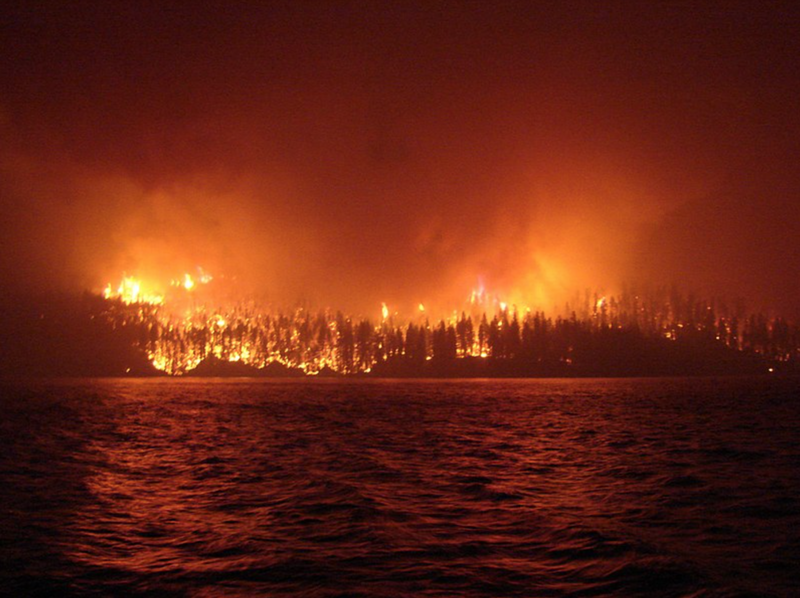 Just as no one really thought the U.S. would get hit with two major hurricanes or that the BC forests would catch fire. Yes, it was a wild and crazy year, but we survived.